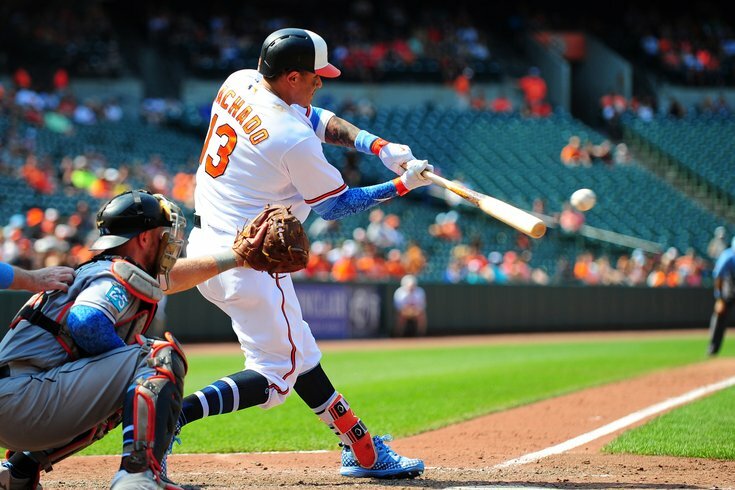 Baltimore Orioles shortstop Manny Machado hits an RBI single against the Miami Marlins. If the Orioles are trying to maximize value for All-Star shortstop Manny Machado, they are doing a pretty good job. With it more or less known that Machado would be shipped to a new team after Tuesday's MLB All-Star Game, it's anyone's guess as to which team will see him suit up next weekend. Reports from all over the place suggest that the Dodgers are the front-runners — but the Phillies and Brewers also have a shot. So, is Machado going to the Dodgers or to the Phillies — or somewhere else entirely? In what could be considered a brilliant (or obnoxious) negotiating technique, the O's are looking to gain more and more leverage by leaking vagaries that force teams to slowly up their offers. The Dodgers, reports say, are prepared to include their top hitting prospect in the deal. Top dodgers OF prospect Yusniel Diaz could be in play in potential Machado deal. Hit 2 bombs in futures game. If so, that may be hard to beat. As said, Dodgers lead as they head toward finish line. Of course, if you pay close attention to the time stamps on all of these tweets, the aforementioned tweet about the Dodgers came early this morning, before Nightengale's tweet and before Bowden's tweet. All of this is a jumbled mess of misinformation that is — perhaps — by design to try and entice the Phillies to toss in their top pitching prospect, Sixto Sanchez, who as of Tuesday afternoon was off limits (though Philly was reportedly offering their second best arm Adonis Medina). The price appears to never have been higher for two months of Machado's services. But it is more than that. Aside from the obvious upgrade over struggling Scott Kingery at shortstop, the trade for a rental will no doubt make the Phillies a real contender this fall, not only in their own division but in the entire NL. It also could help the team get an advantage in swaying Machado to sign with the team longterm — which it intends to do anyway. Machado, who has hit .315 with 24 homers so far this season, just wants this all to end. “I have no idea," Machado told the media Monday, when asked when or if he will be traded. "At this point, it doesn’t matter. I can’t control it. Just get it over with already, go on and not answer these questions no more." Unfortunately for Phillies fans, the trade deadline isn't until July 31. Which means the rumors won't end when Machado is traded. Whatever happens with manny (and dodgers lead), phillies are expected to pick up talks regarding Zach Britton. Big market there: cubs, yankees, red sox, maybe astros, indians, dodgers, others.